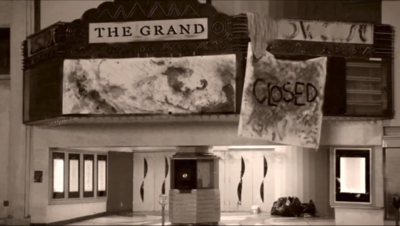 The Grand Showcase Theatre. Built in 1939. Home to numerous ghost sightings and attacks. The Grand Showcase Theatre was built in Hollywood in 1939 and where the aspiring actress Janet Myers was killed in 1949. Since her death, she has haunted the theatre and terrorized people who try to enter. Her ghost was vanquished by the Ghostfacers. One month afterwards, the rundown theatre was purchased and currently undergoing $1.5 million worth of restoration. Harry reveals to Ed that Janet Myers would have potentially killed more people if she wasn't defeated at the time, highlighting the importance of the Ghostfacers. This page was last edited on 2 April 2019, at 01:21.